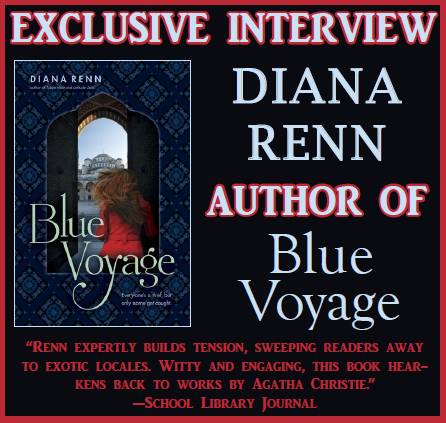 We are fortunate to have Diana Renn swing by to give us the scoop about her latest novel BLUE VOYAGE. Diana, what scene was really hard for you to write and why, and is that the one of which you are most proud? Or is there another scene you particularly love? How long did you work on BLUE VOYAGE? About a year and a half, unless you count the short story that was the original seed of the book. I wrote a (long) short story years ago after a trip to Turkey, about an intriguing group of people I met on a “blue voyage” cruise. I kept revisiting that story over the years, reworking it, until I realized it really wanted to be a book. I sold the book on proposal, based on a five-page synopsis. Then I got busy writing! It was about a year of drafting and revising and another few months with rounds of edits and copyedits with the publisher. I know it sounds long, but for me that was relatively quick. In retrospect I can see that Zan’s journey toward authenticity parallels my own. In this book I’m just having fun and also wrestling with issues that feel important to me personally. I didn’t think of potential readers as much when I wrote this book. It was more for me. I also think Zan’s resilience in the book became a good model for me as a writer. I wrote this in the face of a lot of challenges on the home front – my kid was having some issues at the time – and yet I managed to write a whole book. I learned a lot about setting manageable goals and finding inner reserves of strength. 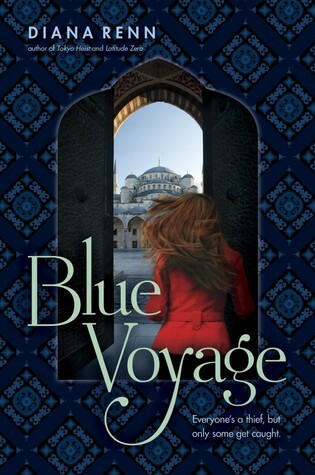 What do you hope readers will take away from BLUE VOYAGE? In addition to being swept away by an exciting adventure, I hope they will become fascinated by a different culture – Turkey – and realize how multifaceted it is. I hope that they might even learn more about Turkey on their own or discover some Turkish authors! I don’t have rituals any more because I’m always scavenging for time, balancing day job stuff with parenting and writing. I have a small home office which is currently unusable because of the distractions of unfiled projects and everybody else’s stuff that has drifted into it! I write in libraries whenever possible. There is a handful of local cafes I can tolerate where the music isn’t too irritating. I cannot, for some reason, work in a Starbucks. I try to make a writing date with a writer friend at least once a week at one of these cafes, to keep myself accountable. Unplug from devices. Look at people, places, the world around you instead of at a phone. (I say this not as a cranky old person but as someone who has to remind myself of this every day). Cultivate interests and hobbies. Have meaningful conversations with people. This will all give you material to write about – it is grist for the mill. Be interested in people and the world. Be alert. I have a couple of projects going on simultaneously and a shiny new idea or two beckoning. But what I’ve mostly been researching and starting to draft over the past year is a mystery set closer to home—my original home, Washington State—and involving a hundred-year-old real-life disaster that gets surprisingly little mention in school history classes. It’s a project of great personal interest to me on terrain that I know well. I can say no more. . . .
Have you had a chance to read BLUE VOYAGE yet? Have you interviewed experts and been worried they might call the authorities? Have you ever had a short story turn into a novel?